Since the majority of video game players in the West are white, when they play a role-playing game, it's not hard to have their character looking and dressing like them. But what if you're not white? Fox Harrell (above), an artist, computer scientist and avid gamer, has written of the problems he's run into in video game RPGs when trying to create a character that, well, looks like he does. 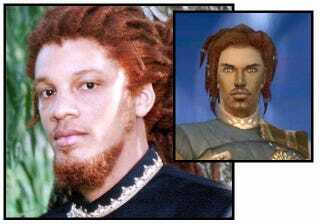 In Elder Scrolls III and IV: I wanted to create a character I could identify as African-inspired (the "Redguard race") but then was automatically made less intelligent. In Guild Wars: Nightfall, I could make an African-inspired character - but I wanted to both have [dread]locks and wear ornate masquerade-style clothing. I could not - locks were allowed for the earthy Ranger class, and the clothes only allowed with the illusion-casting Mesmer class - never to be combined. In Phantasy Star Online, I wanted to be elegant and clean-lined, and smartly-appointed. I could only be a female robot (called a Cast), males were always boxy and hulking. In Neverwinter Nights, I could actually make a character I was very happy with, but in Neverwinter Nights 2 the style was removed. In World of Warcraft, my first inclination was to play a spectral, Undead, ghostlike character - but the males all had poor posture, distended jaws, hulking shoulders, and silly hairstyles. Harrell, a professor at Georgia Tech, is working through this by coming up with Loss, Undersea, a program that's aiming to generate an avatar for a player based not on arbitrary, pre-determined features, but by reflecting their mood and personality. There's plenty more interesting stuff in the same vein over on Boing-Boing, so head over to check out the full thing. Or, if you'd like to roll your sleeves up, you can read Harell's paper "Computational and Cognitive Infrastructures of Stigma", which goes into a lot more detail than simply an avatar's physical appearance.